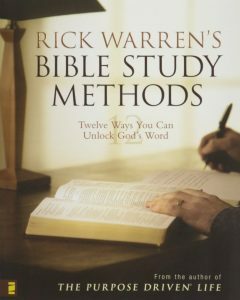 Our Men’s bible study group is working their way though Rick Warren’s first book Bible Study Methods. This book is a great tool for new believers who are looking to learn more about how to live out their faith as well as those who have known Christ for years and simply want to learn some new methods on how to get deeper into the word of God! The group meets Wednesday’s at 6:30 in our main building. So good to hear my pastor’s voice again. I have missed you and missed hearing God speak through you. I hope all is well with family and church. WOW. I just saw this. How you doing? I’d love to see you and get together. I miss you, old friend. write me back at richard@fellowshipbible.net. Love you man.